The Chaos Emeralds have undergone various changes in their shape and colours over the years. It is not clear if these alterations possess a deeper narrative significance are or simply are for aesthetic reasons. Many theories have been formed to explain these visual discrepancies, but some of them obscure the more subtle aspects of the modifications. Here, the variations in colour and size will be explored and theorised. The first form was used in the three original Mega Drive games and depicts the Chaos Emeralds with a hexagon shape. The 16-bit version of Sonic 3D also used this form, but added a dimple to the Emeralds (Presumably this was designed to create a strong 3D definition and not to resemble cough drops). When in their hexagon form, the Emeralds are also depicted as ‘hand-sized’ in the cut scenes (i.e. they fit in Sonic’s hand). The only exception to this are the special stages, which make the Emeralds body-sized (i.e. the size of Sonic’s body), but this is most likely to visually emphasise the excitement of completing the stage. The body-sized diamond-shaped form debuted in Sonic 3 and Knuckles, where the Chaos Emeralds were explicitly referred to as Super Emeralds. 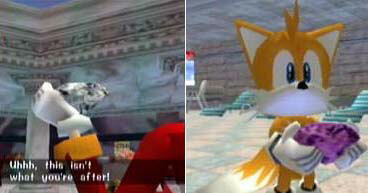 The form was later used in the past shrine of Sonic Adventure and the ARK shrine of Sonic Adventure 2. Both these games termed them as Chaos Emeralds, which may or may not differentiate them from the version seen in Sonic 3 & Knuckles. A hand-sized version of the diamond shape form is the third style of Chaos Emerald, which has been used in every single game since Sonic & Knuckles, with exception of the Game Gear games and the Mega Drive version of Sonic 3D. As with the Hexagon shaped type, this form becomes larger than the body-sized version when the Emeralds act as an end-of-level goal. A consistent pattern can be identified in these categories – when the Chaos Emeralds are placed on a shrine, they transform into the body-sized diamond shape form. The shrine, and not the Master Emerald, appears to be the catalyst for this change, as in the Super Sonic story portion of Sonic Adventure the Chaos Emeralds are shown to retain their hand-sized dimensions when placed next to the 'mighty stone'. Based on this pattern, the size and shape variations of the Chaos Emeralds cannot be for aesthetic reasons. If Sonic Team had made alterations for the sake of greater aesthetic appeal, it is likely that they would only use a single style with an individual game. Sonic 3 & Knuckles and the two Adventure games each feature two of the above identified forms. The instability of the Chaos Emeralds can also not be used to explain the changes, as it is unlikely that their unordered energies would cause the Emeralds to consistently enlarge when placed next to a shrine. A change in perspective is often used to explain the change from the first hexagon form to the third hand-sized diamond shaped appearance. It could be possible that the original Mega Drive games solely depict the Chaos Emeralds from a birds-eye angle and in turn create their hexagon appearance. The later games tended to be in 3D and so allowed for a more varied use of perspective, which could relay the full diamond shape of the Emeralds. It is notable that the 3D games contain many scenes which present the Chaos Emeralds from above and in-turn produces their original hexagon appearance. However, there are three examples from the earlier titles which challenge this theory. Firstly, the special stages of Sonic 3 rotate when the Chaos Emerald is collected allowing the gem to be seen from a varied perspective. When the camera angle changes, the Emerald appears to retain its hexagon shape. Secondly, in the bad ending of Saturn Sonic 3D the Chaos Emeralds are in shown to be their hexagon form but do not posses a diamond shape when they rotate. Thirdly, in the 16-bit games the Emeralds are hexagon shaped even when being held by the characters. 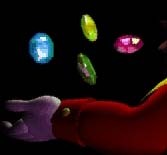 Therefore, in order for the theory to work, the characters must have changed the way they hold the Emeralds after the 16-bit games, which seems bizarre. These challenges to the perspective theory are not with out their own problems. The limitations of the 16-bit graphics in Sonic 3 make it difficult to clearly view the Emeralds' hexagon dimensions as the gem turns. It is notable that the movement only occurs briefly, creating the possibility that the programmer took a short-cut in representing the structure of the jewel. The presence of the hexagon Emeralds in Sonic 3D's ending is baffling as the special stages contain the diamond shaped form. The special stages were the only portion that Sonic Team directly programmed and so the flat build of the hexagon shaped Emeralds in the bad ending may have been a mistake by the cut-scene programmer. The theory does have some merits (for example, its the easiest way of explaining why the Emeralds have a Hexagon shape in the special stages of Sonic Pocket Adventure, but diamond shaped in the game's cut scenes), but it clearly doesn't provide a flawless explanation for the change from the hexagon to diamond shaped form. A more credible explanation can be found in the events of Sonic 3 & Knuckles. When the Chaos Emeralds are brought to Hidden Palace they change from a hexagon shape into the body-sized diamond shaped Super Emeralds. In later games, the Emeralds revert back to their original name, but still retain their diamond shape despite being hand-sized. Hence, the transformation in Hidden Palace could have had a permanent effect on the shape of the Emeralds, but as the gems are no longer at the shrine, they are unable to preserve their body-sized proportions. This theory is partly supported by the Mega Collection Strategy Guide, which states that the Master Emerald powered-up the Chaos Emeralds. 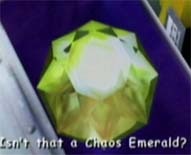 In the past scenes of Sonic Adventure, the Chaos Emeralds are diamond-shaped and body-sized on the shrine, but shrink to hand-sized when Chaos attacks. Therefore, it could be possible that sometime after the attack, an event occurred which caused the Chaos Emeralds to transform from a diamond to a hexagon shape. 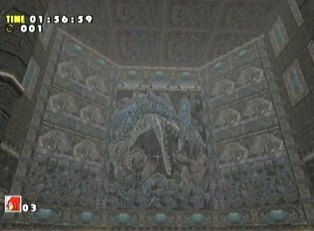 The Lost World stage contains a mural depicting the destruction of city by Chaos. This is a different attack from the one shown in the flash backs of Super Sonic’s adventure, as Chaos is in his perfect form. Surrounding the mural are hexagon shaped Chaos Emeralds. While this mural is hardly definite evidence of the proposed theory, it could suggest that a possible shape transformation may have occurred after Perfect Chaos attacked. The colours changes of the Chaos Emeralds are even simpler to explain, at least in the games that Sonic Team developed or supervised. Each Sonic game tends to alter its palette of colour. Sometimes this may be to create a particular style, such as the use of darker colours in Sonic Adventure 2. Other times it may be to technological advancements, such as the subtle colour shades found in Chaotix. By bearing this in mind, it can be seen that the Emeralds don’t actually change colour but merely alter their shades to the aesthetic style of the individual game. In extreme cases, this alternate shade can be mistaken for a new colour, such as the gray Emerald in the Advance games, which is probably just a dark shade of white. The exceptions to this are Sonic R and Sonic Battle. The racing game features both a yellow and an orange Emerald but not a sky blue. The reasons for this are unknown, but it is most likely just an error. Note that in the ending, the orange Emerald has been replaced by a Sky Blue. Sonic Battle features all green Emeralds and this was most likely a design short-cut. The Game Gear games tend to feature the largest colour deviations, such as the black Emerald in Sonic & Tails 2. While it could be possible that these are also due to the use of different shades (for example, the black Emerald could be an extremely dark shade of gray which in turn is a darker shade of white), it is more likely that deviations derive from the absence of the original Sonic Team to guide the colours used.